Eric Clapton is one of the biggest Rolex Collectors. 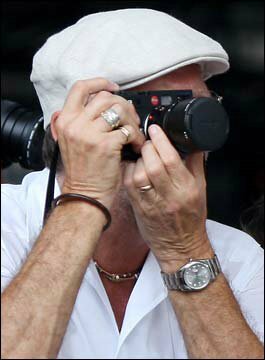 In this photo he is wearing a Platinum Day-Date, and he is demonstrating the dangers of shooting with a Rangefinder Camera. In other words, he is looking through the rangefinder taking a photo not realizing that the lens is covered. In the future we are going to be doing a Definitive Series on the Eric Clapton Rolex Collection.